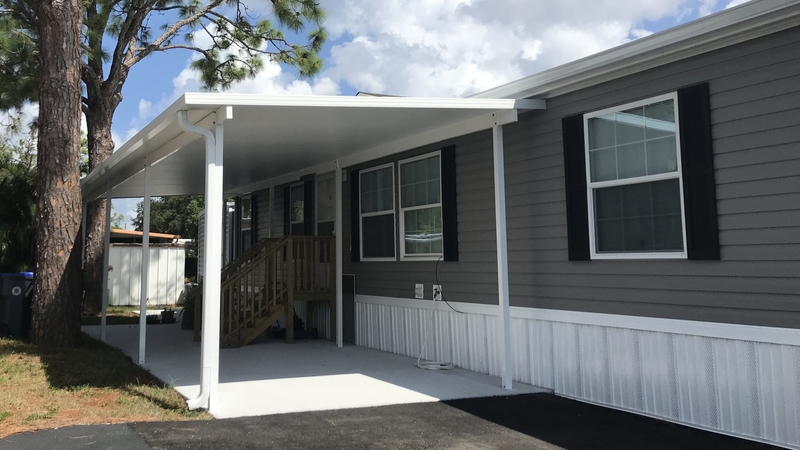 This recent mobile home add-on project is a new carport in Titusville, Florida, and includes features to allow a future upgrade. The 14′ x 38′ carport has a 4th wall and premium 3 inch insulated roofing panels that will allow an easy upgrade in the future. Our design will accommodate the homeowner’s future plans to have us convert the carport to a combination carport and screen room. Making this a multiple phase project allows the owner to pay now for their immediate need, and have us upgrade it later when ready. 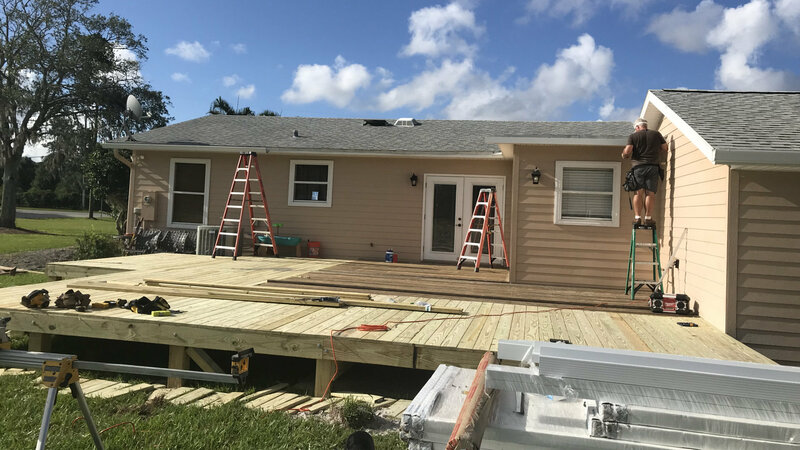 Interested in a similar project for your Central Florida mobile home? Call 321-978-5500 today for a prompt quote. We are here for mobile home owners searching for color coordinated aluminum awnings to complement the existing color of their home. The photo here demos a color combination of tan with dark green stripes we created to complement the mobile home siding and shutters. 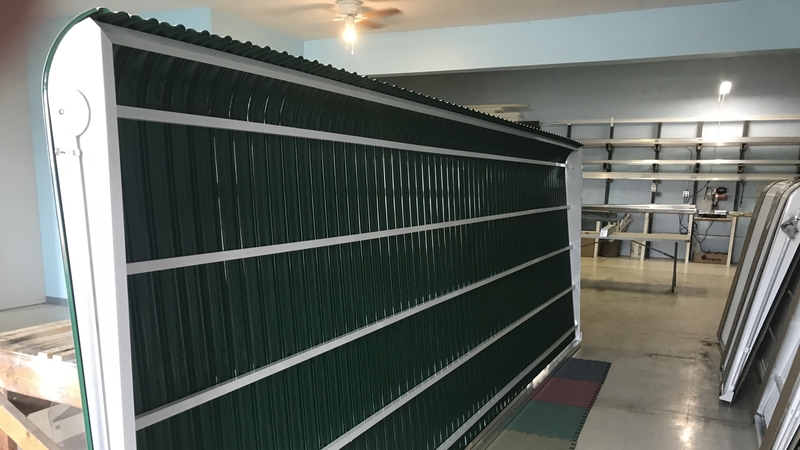 Haggetts manufactures custom clamshell aluminum awnings in our factory in Cocoa, Florida, and we offer a variety of color options. In addition to manufacturing aluminum clamshell awnings, we have Bahama awnings plus custom screen rooms, carports, and storage sheds. Visit our aluminum awnings color gallery for a simulation of different color options. Questions? Please call 321-978-5500 today! 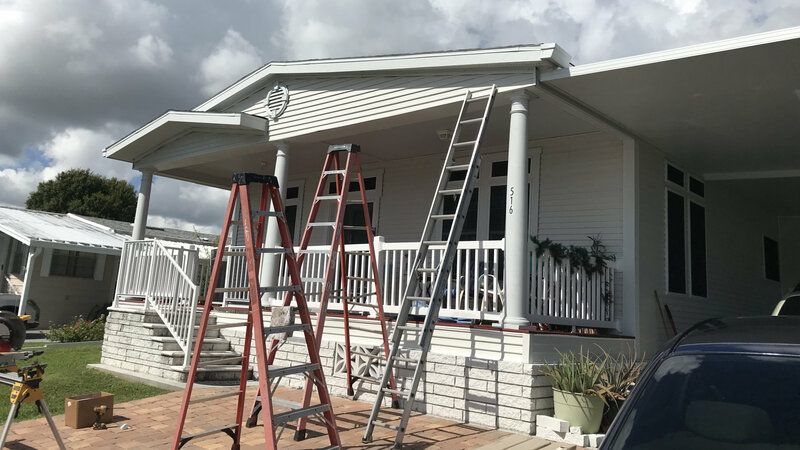 The series of photos in this post illustrate a wide range of Haggetts Aluminum products created for this Florida mobile home upgrade. The collage consists of 12 photographs marked A through L, and a brief description of each is included in the following A to L list. This Central Florida mobile home was a square box delivered brand new on a dirt lot several years ago with zero outside enhancements. 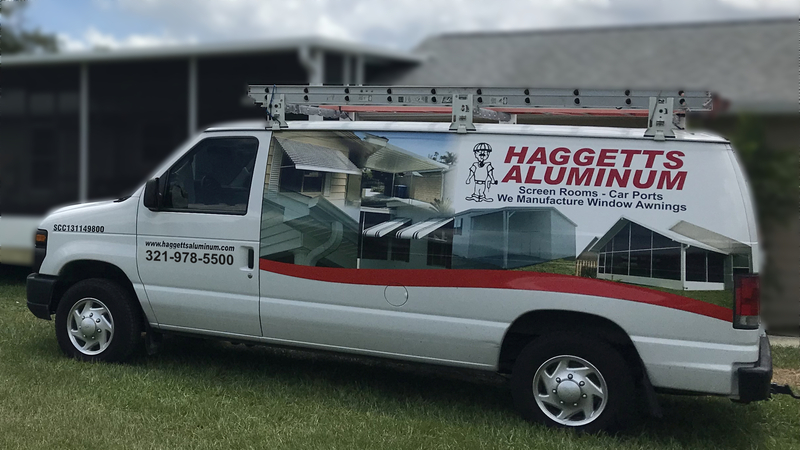 The homeowner has known our founder Tom Haggett more than 20 years, and contracted Haggetts Aluminum to perform the mobile home upgrade. Improvements included pouring two cement driveway foundations, building the small carport, building two stair cases with railings, installing Bahama 3/4 awnings on all windows, custom designing and building the cathedral height screen room and carport, and finally installing a matching custom storage shed. The homeowner could have requested clamshell aluminum awnings, or full length Bahama awnings, but they preferred the 3/4th length version. Need awnings, a screen room, carport, or storage shed? Trust Haggetts Aluminum to provide a quality shade solution for your mobile home. Call 321-978-5500 today for a prompt response and price estimate. 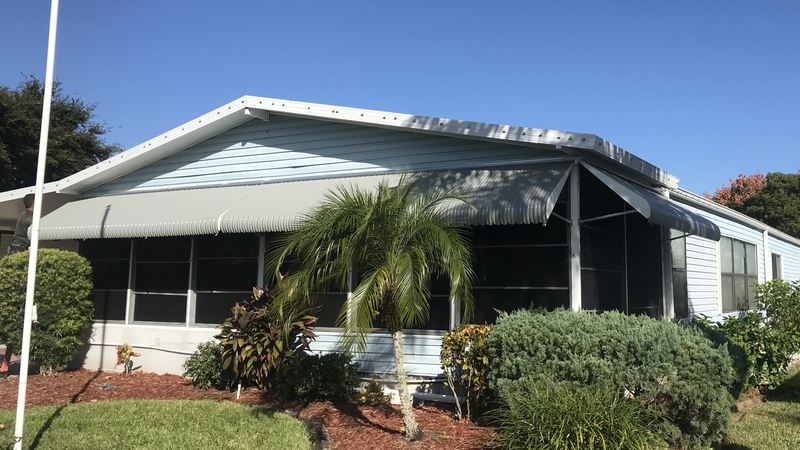 This custom aluminum awning installation required thinking outside the box to mount this recent Melbourne Florida awning project. 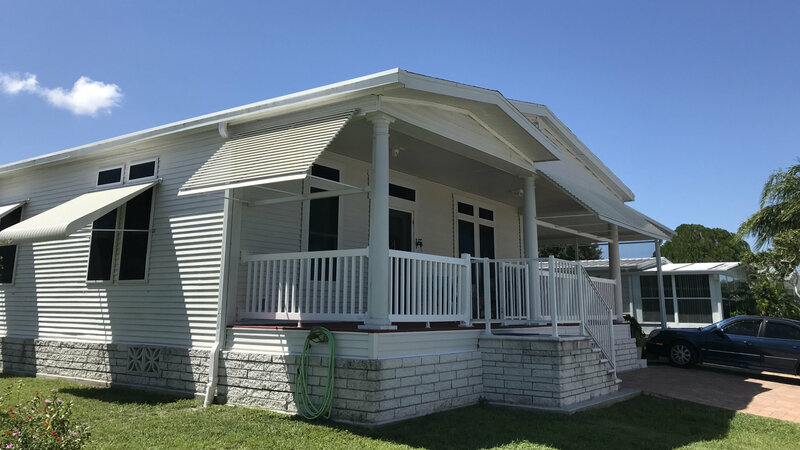 The project included Bahama style awnings mounted on porch pillars instead of a wall, and clam shell awnings on all the windows. The photo above shows 3 arms we attached to the horizontal support between the pillars, and 2 more arms attached to the pillars. 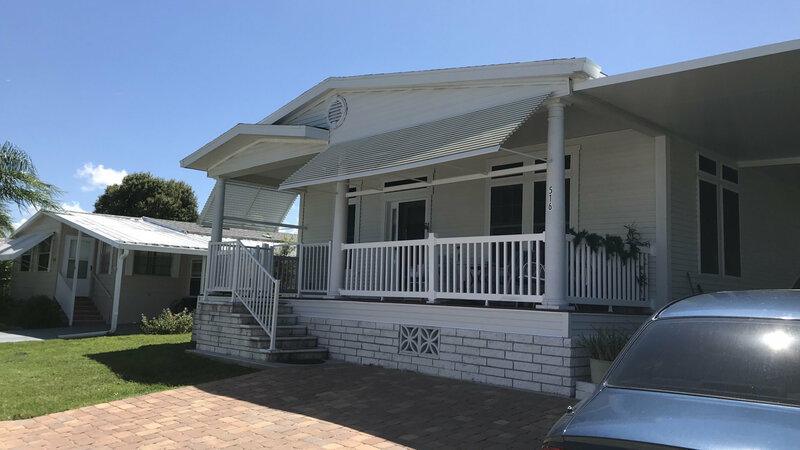 The final photo shows the completed project with Bahama awnings on the porch and two of the custom clam shell awnings on windows. Note the porch side Bahama awning and custom mount, as well. Clam shell aluminum awnings were installed on all windows of the home. This is another example of the creativity you can expect from Haggetts Aluminum to design custom awning solutions for mobile homes. Need a quote for awnings, a carport or screen room in Central Florida? Call 321-978-5500 today for a free estimate. 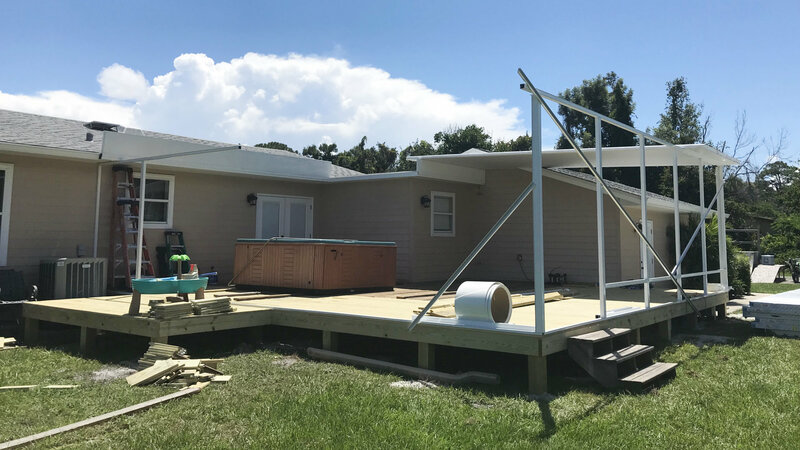 This series of Central Florida custom deck screen room addition photographs display our project progress from start to finish. The customer already built the wooden 30ft x 30ft deck shown above, and wanted us to custom design and build a screen room enclosure. The photo above shows the first phase of the aluminum wall framework and the start of our clever design to connect to the roofline. The final photo displays the completed project including walls, screens, peaked roof, gutters, and a small outside deck extension. Most screen rooms are built on a poured concrete base on the ground, so our customer was very pleased with our creative solution. Have special needs for a carport, storage shed, or screen room? Call 321-978-5500 for a no obligation quote. 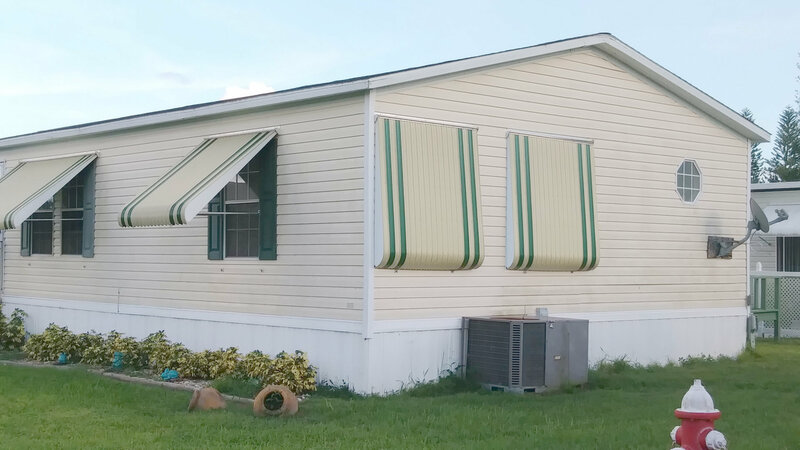 Our shutter style Bahama awnings are another option for Central Florida customers looking for low cost mobile home shade solutions. This Bahama awning installation for a Central Florida customer shows 2 panel and 3 panel widths. We can custom fit all your windows. 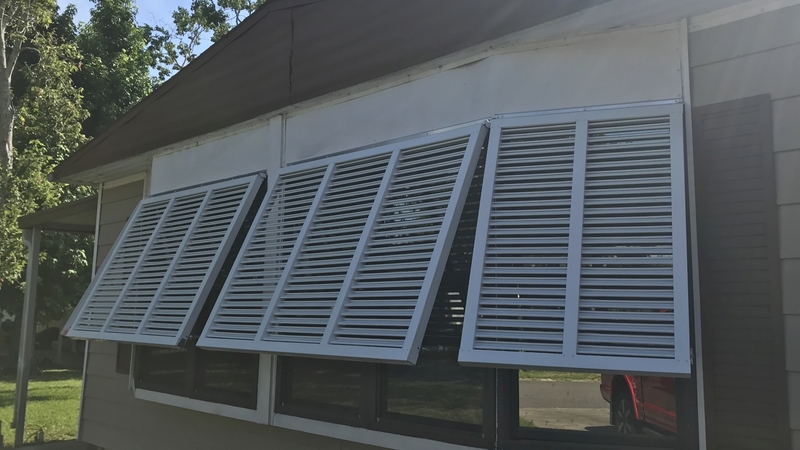 The louver design provides shade to help cool the interior of your home while protecting furnishings from harmful direct sunlight. In addition to ensuring your privacy when viewed by people outside, the angled shutter style still lets you see outdoor activity. Does the shutter style Bahama awning look right for you? Call 321-978-5500 today for a free estimate. 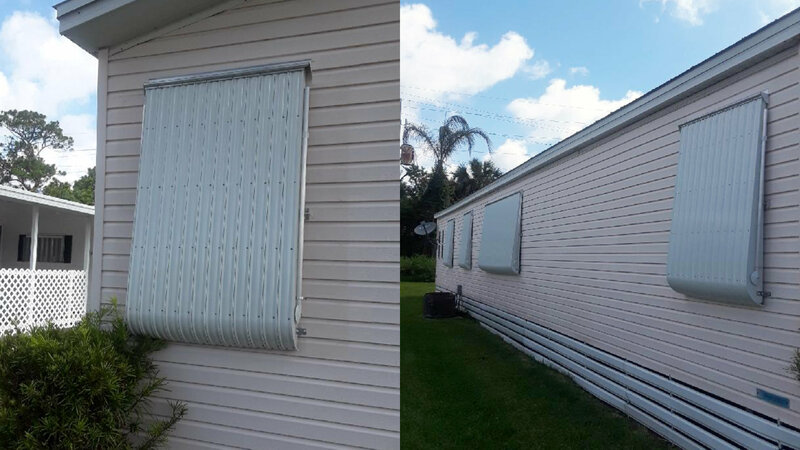 The locked down window awnings shown in the photograph here were recently installed on a manufactured home in Ft Pierce, Florida. 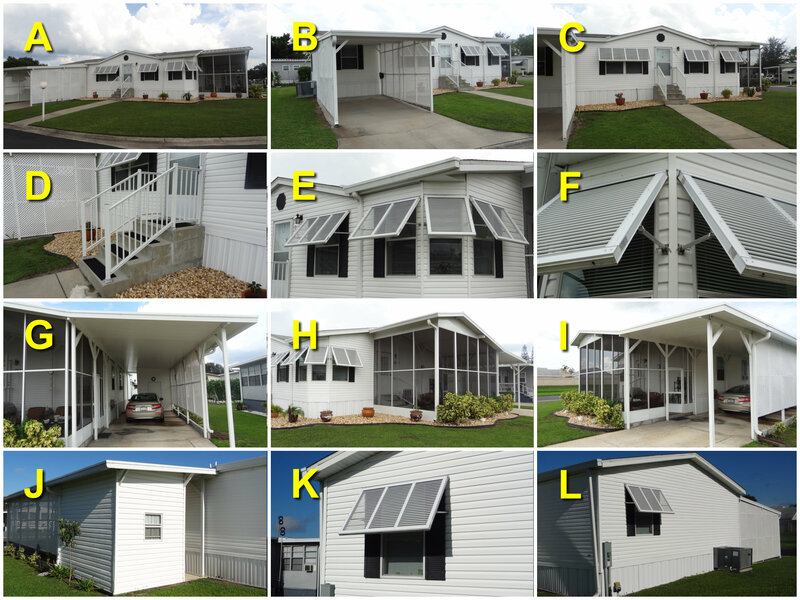 The split photo displays awnings in the down and locked position on two sides of the home. All windows had new awnings installed. This customer was spending the summer months up North and wanted the windows protected from severe storms while they were away. We custom manufacture these aluminum clamshell awnings in our Cocoa Florida factory, and the lockdown option is a standard feature. 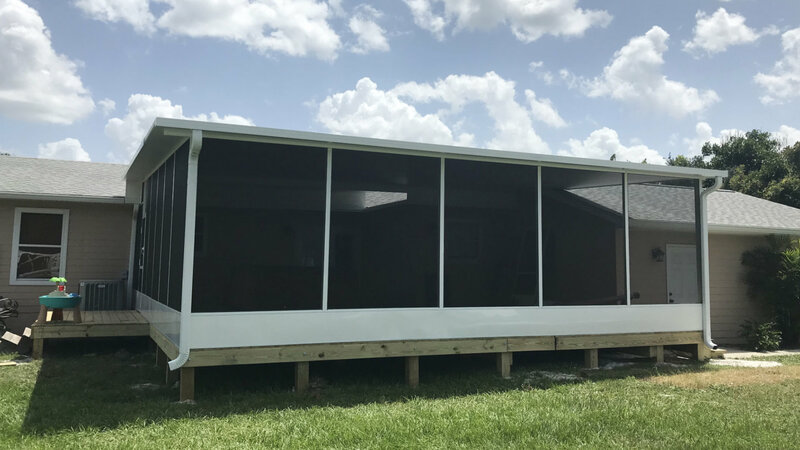 We also design and install custom screen rooms, carports, and storage sheds for Central Florida mobile and manufactured home owners.